Tomorrow we will celebrate Father's Day. I'll be with my son and my son-in-law, all of us fathers. We'll be surrounded by six little ones–all five years of age and younger. It should be a busy but fun day. It got me thinking back to the evolution of my life as a father–now grandfather–and all the changes that I've made and those changes in society over those years for men/fathers as well. My son-in-law provides the day-to-day care of the children while my daughter works full time. Her work allows some "work at home" time that gives flexibility to this young family. My daughter-in-law works in an office at home while my son works in an office away from home. My son shares the load pretty evenly for care of their three children, working out many details together. Today's NY Times (click HERE) includes an interesting story about this transformation of dads. Dads don't have an easy job in today's world, it turns out. And... neither do moms. Happy Father's Day to all those hard-working dads out there! So it’s official…Ford Motor Co. is killing off the Mercury, once again demonstrating the impermanence of just about everything in your life if you live long enough. Gosh, I loved Mercs, as we usually called them. I even loved them before James Dean drove a ’49 Mercury two-door in “Rebel Without a Cause,” a movie that came out in 1955, the year I got my first driver’s license. I must have seen that movie half a dozen times before I grew up, always admiring that deep blue ’49 Merc and dreaming that one fine day I would own one. In my late teens, I actually did own a beat-up gray ’50 Merc (’50 Mercs were almost identical to ‘49s except they had different dashboards, door handles and some other exterior trim). The clutch slipped so badly on my ’50 Merc that it was a challenge to go up steep hills, but who cared? It was a Merc, similar to James Dean’s. When the brakes gave out one time, it hit a utility pole head-on, mutilating the front bumper, bending it in where it had struck the pole. Who cared? Who had money to fix it? Not me. I didn’t like to work then. So I kept driving it, bent bumper and all. Once, stopped in downtown Duluth for a red light, I recognized the mother of a kid I knew from school walking with another woman across the street in front of me. I heard her remark to her companion something about what a disgusting car it was. It wasn’t disgusting to me. It was like the car James Dean drove in “Rebel Without a Cause.” Sort of. That made it special. A buddy of mine actually got a dark blue two-door ’49 Merc exactly like the “Rebel” Merc, but it had been through the mill. It looked pretty good at night if the moon wasn’t too bright. We used to sit and stare at it after dark. 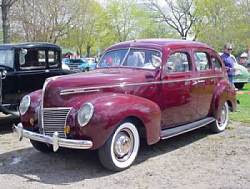 I had a ‘48 Mercury engine in my first car, a 1940 Ford DeLuxe Coupe. It had more horsepower than the original Ford V-8 until it blew up (“threw a rod” in technical terms) one summer evening on old Highway 61 near Nopeming. A mechanic friend replaced the shot motor with a ’49 Merc engine (even more horsepower). I have taken it upon myself to mark in writing the passing of American cars in recent years. Oldsmobile made it into my book, “Cooler Near the Lake.” The recent demise of Pontiac was, like Mercury, the loss of an iconic brand. So was Plymouth, although I never FELT for Plymouths. We used to call them “flatshafts,” a term referring to problems in the bowels of their six-cylinder engines. James Dean wouldn’t be seen dead in a Plymouth, although he was seen dead in a Porsche. And now Mercury. They’ve just been Fords in different clothing in recent years, but they’ve always been there. They were introduced the year I was born. And if you live long enough, you see the impermanence of just about everything in your life. I know, I said that, but it’s worth repeating. Looks like now we’re even losing the Gulf of Mexico. Concerning the headline above: If he were still alive, I would apologize to J.D. Salinger, who wrote a short story, “To Esme With Love and Squalor.” But Salinger’s dead, too, demonstrating the impermanence of… Well, you know.